It does seem to be Creek Week, doesn’t it? 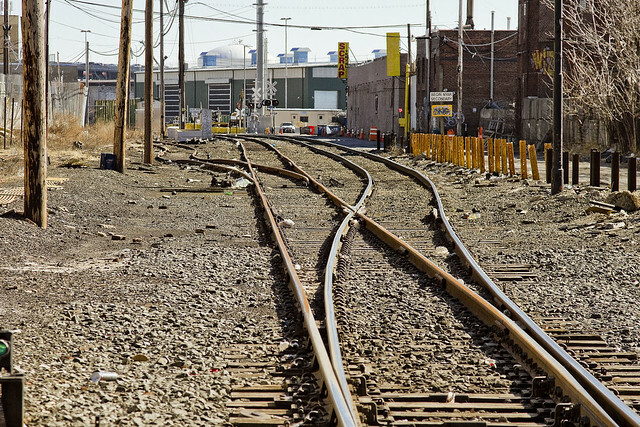 In yesterday’s post, I told you about Deadman’s Curve in Maspeth, and we explored 57th avenue – the former “Creek Street.” The shot above looks eastwards towards Deadman’s Curve from the former Penny Bridge LIRR stop at Review Avenue. The water facing property is currently owned by John Quadrozzi Jr., who is a major land holder in the Red Hook and Gowanus areas. The property seems to be mainly used for storage and maintenance of heavy construction equipment these days. As the name of the LIRR stop would imply, this is also the former location of Penny Bridge, which connected Brooklyn’s Meeker Avenue to Queens’s Review Avenue. Additionally, the Roman Catholic Church used to run a ferry service from Manhattan to Calvary Cemetery which docked nearby. Review Avenue, the stretch of it that runs along Calvary Cemetery, is where the first large scale petroleum refinery in the United States was founded – Abraham Gesner’s North American Kerosene Gas Light Company, which would become first the New York Kerosene Gas Light Company and then be acquired by Charles Pratt and Standard Oil and rechristened it as the Queens County Oil Company. Queens County Oil’s bulkheads are the ones that the Blissville Seep oozes petroleum into Newtown Creek from. If you follow Review to the west, you’ll find the Greenpoint Avenue Bridge and a pair of roads which descend downhill on either side of it. They take you to, and from, Railroad Avenue. 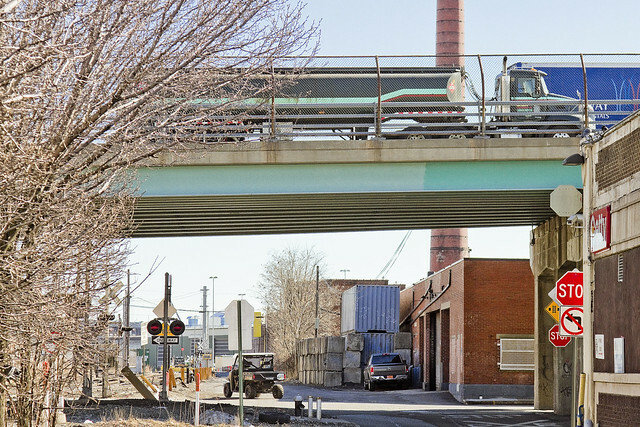 The eastern side of railroad avenue was formerly the home of the Van Iderstine company, who had their own rail spur down here which was populated with Van Iderstine’s distinctive black tank cars. 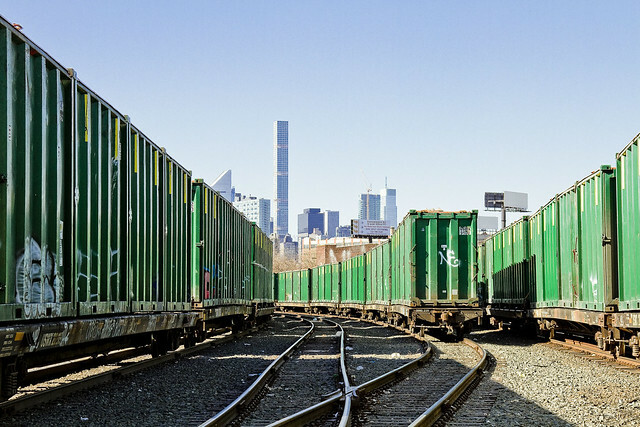 As the name of the street – Railroad Avenue – would imply, it’s all about the tracks down here and on the western side of the Greenpoint Avenue Bridge you’ll find the LIRR’s Bliss Tower and Blissville Yard. Welcome to DUGABO – Down Under the Greenpoint Avenue Bridge Onramp. Van Iderstine was a nightmare of a company, incidentally, or at least their occupation was. They were renderers, which means that pack animals, butcher scrap, rotten eggs, barrels of abattoir blood – even dead circus elephants – would be brought here to be broken down into components. What exited the factory was tallow. Speaking of smelly, the modern occupation of the Blissville Yard is garbage. 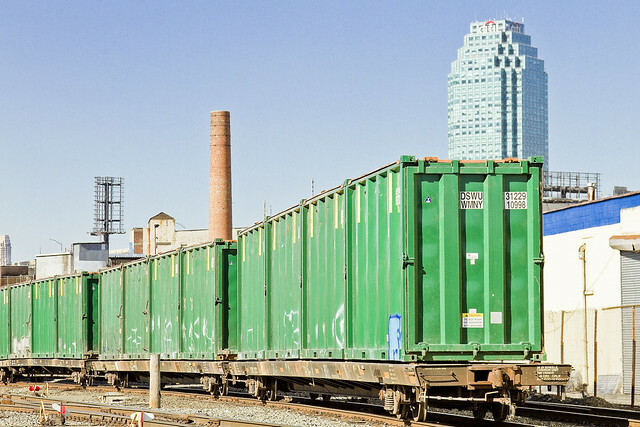 That’s the Waste Managemnt garbage train you see above, which is shipped around and about by the New York and Atlantic freight line. NY&A services two Waste Managemnt facilities on the Creek – one here in Blissville and the other in Brooklyn’s East Williamsburg along Newtown Creek’s English Kills tributary. Something like 30-40% of all of NYC’s putrescent (black bag) waste comes to Newtown Creek to be processed and shipped off in green boxes such as the ones above. Railroad Avenue is one of those cul-de-sac streets along the Creek where there’s only one entrance or exit and which – if you get in trouble or hurt, it’s going to be damned difficult to explain to the 911 operator where you are. At the west end of the street is Sims Metal Management’s Newtown Creek dock, on the east you’ll find Waste Management’s Green Asphalt works, the same company’s putrescent waste transfer station, and the Marlyn industrial park which hosts such luminaries as LeNoble Lumber and A&L Cesspool. Personally, I’d call Sims for help, as they’re closer than any hospital and I know a couple of guys who work there. This is, incidentally, some of what you’ll find located between Review Avenue, the Lower Montauk tracks, Railroad Avenue, and Newtown Creek. 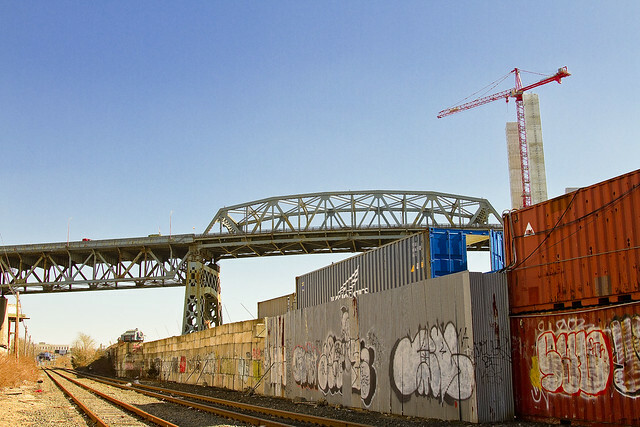 The Blissville Yard connects to the DB Cabin railroad bridge, which connects Blissville Yard to the Wheelspur and Hunters Point Yards in Hunters Point, and which crosses the Dutch Kills tributary of Newtown Creek. There’s also a connection to the M Cabin bridge which leads to the abandoned Montauk Cutoff tracks and Sunnyside Yards. 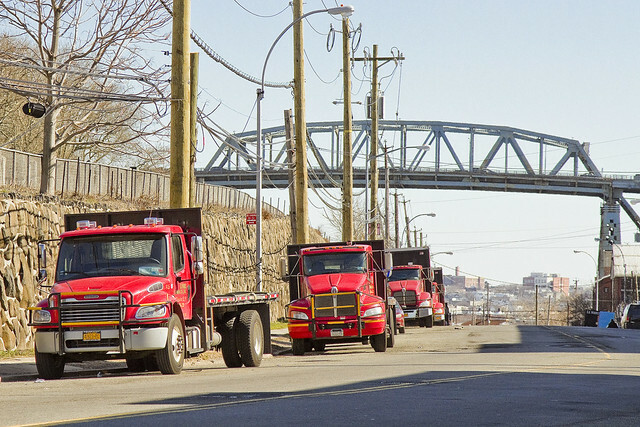 Freight traffic on Newtown Creek heads east into Maspeth and to the Fresh Pond Yard, eventually meeting the switch to the New York Connecting Railroad through Woodside and Astoria, which leads to the Hell Gate Bridge. 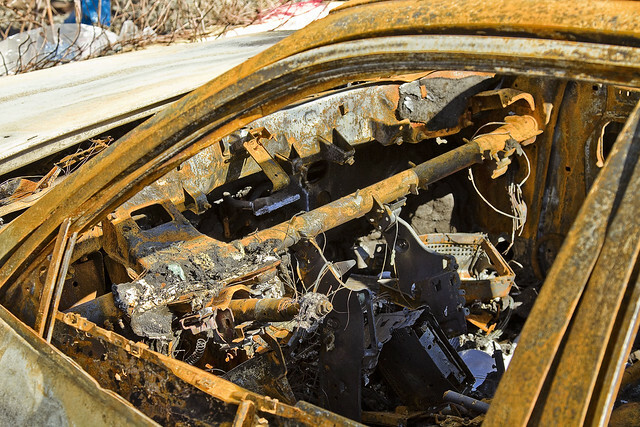 Down towards the end of Railroad Avenue, one encountered this immolated automobile. As mentioned multitudinous times, I cannot resist this sort of thing. 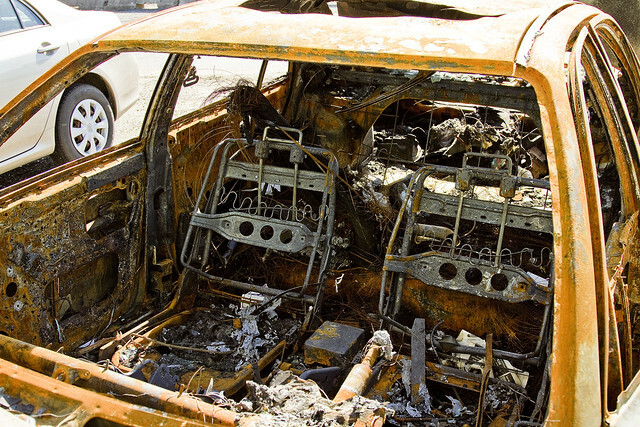 This car wasn’t just burned up, it was thoroughly incinerated. 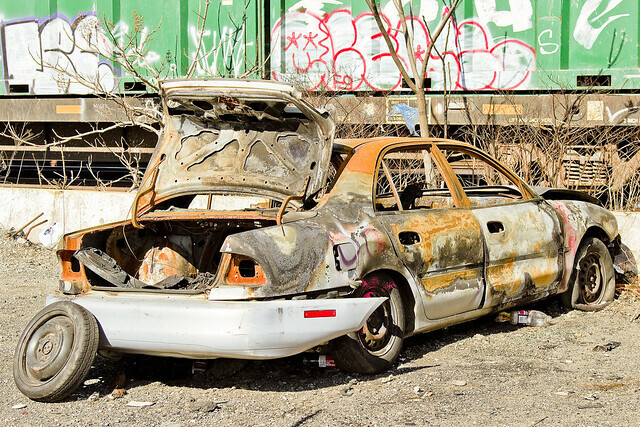 That’s the sort of stuff you’ll see on Railroad Avenue, here in DUGABO, in the Blissville section of Queens, along the lugubrious Newtown Creek. Meeker avenue street end on Brooklyn side, and on the Queens side, it’s where the LIRR station used to be on Review opposite the secondary gates of Calvary. The masonry of Penny Bridge is still there on both sides.